Have you enjoyed your demonstrator experience so far? Have you taken advantage of all the great perks, discounts and other exclusive resources? $300 or more in sales per Stampin’ Up! quarter allows you to renew your demonstrator status from quarter to quarter. Your first quarter is calculated as from the time you join through the first FULL Stampin’ Up! quarter. Stampin’ Up! quarters are January – March, April – June, July – September and October – December. If you join DURING a quarter, you will get the remainder of that quarter PLUS the first full quarter to reach $300 in total sales. $300 in total sales includes your customer purchases (workshop, customer and on-line orders) AND personal product purchases (demonstrator orders). It does not include orders for business supplies, shipping or tax. After your first FULL Stampin’ Up! 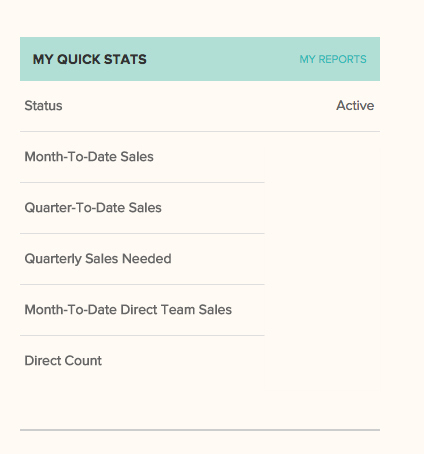 quarter, your demonstrator status will renew every 3 months if you continue to reach $300 in total sales. In the event you do not reach $300 in sales by the end of the quarter, you will go into “pending status” the following month. Think of this as a one month grace period to “catch up” your sales and a last chance to renew and remain active. You will still have full demonstrator benefits and discounts during your pending month. Not sure where to find your total sales totals? Visit the demonstrator website, log in and look at your key stats section on the first page – lower right corner of the demonstrator home page (example below). If you have any questions, please email me (simply reply to this email) or contact demonstrator support at 1-800-STAMPUP. I’m here to help you stay active as long as possible!